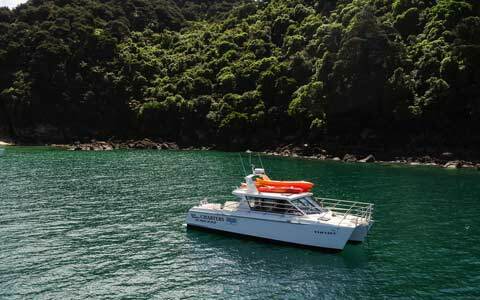 Taranui and Torea are our comfortable, modern catamarans for your cruising pleasure. At Abel Tasman Charters we have a thing about catamarans due mainly to their stability ensuring a smoother ride in most weather conditions. They also have the advantage of being roomy and so have wide comfortable saloon and deck areas and the all-important full bathroom facilities. The fact that they don't draw much water ( 1m or less) means we can get up close to those beautiful Abel Tasman beaches as well. We have two luxurious additions to our fleet, monohulls 'Sweet Release' and our 'Kennedy 19'. 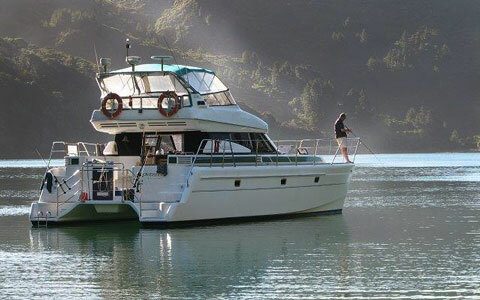 You can privately charter them to enjoy your own adventure in the Abel Tasman with a crew taking care of the boat. Even though the boats are capable of large groups we still keep our numbers of travellers small to provide you with the feeling you are out with a group of friends. Introducing Taranui, our power cat. Modern & comfortable with great scenery viewing platforms both stern and aft, plenty of room to seat 8 travellers comfortably. She is fitted with a galley, WC and shower. Taranui is Maritime Safety Authority surveyed for 25 day passengers. Wright/Lavranos designed. Taranui is an 11 metre, semi-displacement, power catamaran. This hull type gives a soft and stable ride. All aluminium construction, Taranui was commissioned by Rod and built by Murray Newman of West Coast Boats in Raglan. She has twin 200hp Volvo engines - spinning 22 inch Tiger props on shafts, and carries 800L of diesel and 300L of fresh water. Range at 14knts is 450 miles with a cruising speed 12-16knts and a top speed is 22knts. Taranui is the Maori name for the caspian tern, a bird that can be seen fishing in the Abel Tasman. You might spot some of these seabirds as we cruise along. Luxury 45ft (13.7m) 16ft (4.8m) beam. 280 hp cruising catamaran with efficient full displacement hull offering luxurious safe stable exploring platform that exceeds maritime safety requirements. Comfortably accommodates up to 19 guests for daytime cruises and up to 5 guests for overnight or extended charters. Large saloon with spacious lounge seating and large windows for sheltered viewing. 2 double and 1 king single beds with inner sprung mattresses, quality linen and central heating. Comfortable bedrooms and fully equipped kitchen. All bedding and towels are provided. Sweet Release is a 12.2 m or 40ft EK40 Fibreglass built in Whangarei. She runs a Yanmar 440 horsepower diesel engine. Sweet Release has 2 double cabins, a well-appointed galley and also a generous saloon with flybridge. She is available for exclusive charter. We use GP Engineering built tenders. The tenders that we use are designed and built right here in Nelson, by Grant Parkins of GP Engineering. They are rigid inflatables with an aluminium hull of GP Engineering's 'Wavebreak' brand. We have a 4.2m Wavebreak model that is custom made, extremely stable and has a fuel compartment under floor. This is powered by a 60 h.p 4 stroke Yamaha engine. Our other tender is a 3.8m Wavebreak with 10 hp 4 stroke Honda motor. 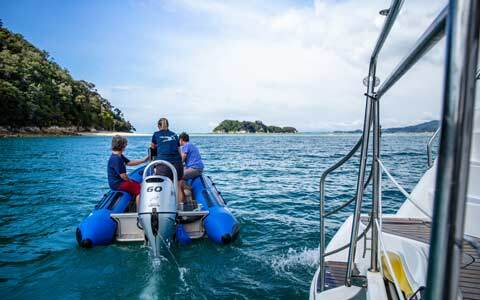 Both models provide a comfortable ride and allow us access onto the pristine quartz sand beaches of the Abel Tasman. Enjoy a kayak in the Abel Tasman. 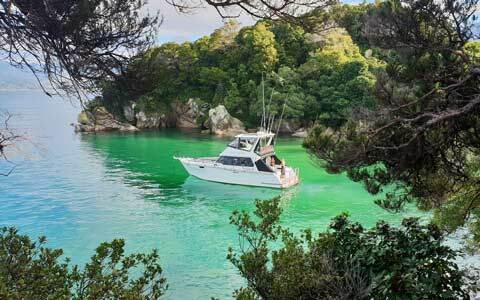 Experience the Abel Tasman in different ways - if you want to. 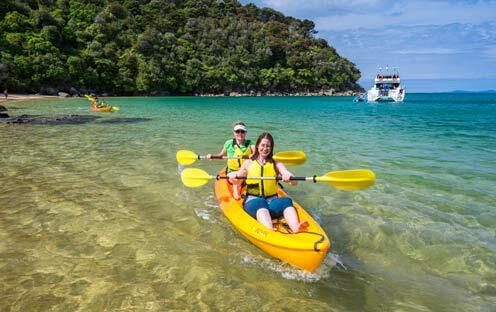 Enjoy your cruise, then take one of our kayaks for a paddle to see the Abel Tasman from a different view point. We provide sit on top kayaks which don't confine your legs inside the deck of the boat and so are excellent for new kayakers with no need to learn wet exits or rolls. They're great so everyone can enjoy a paddle including children. We would like to thank you for a FANTASTIC day on your boat! We enjoyed every moment! This was truly worth it! Thank you for your comments, information, lovely lunch and for giving us (and especially Granny!) wonderful memories to take with! THANK YOU!! Thanks Again. I could not recommend the trip highly enough. It was just a great way to see and walk lots of the park without having to walk/camp the entire way. A truly amazing experience.